Massage is ideal for all people and body types. The benefits of massage are experienced universally, although the benefits are different for each individual. Massage can help with stress relief, varying pain relief, muscle tension, myofascial pain, as well as many other complaints. 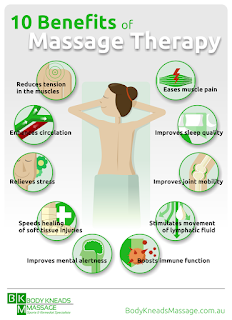 There are many varieties of massage, including Swedish, sports-directed, myofascial, trigger point, and deep tissue. Massage can also help alleviate symptoms from headaches, fibromyalgia and soft tissue strains. Massage is known to be beneficial both before and after sports competitions. Your skeletal system is also positively affected-although indirectly- by massage. Massage helps to bring blood and nutrients to the bones and alleviate joint stiffness. Another system that is positively affected by massage is the respiratory system. Massage can help relieve congestion in the lungs and chest, and as a result of this reduced congestion, will reduce the energy expending when breathing.